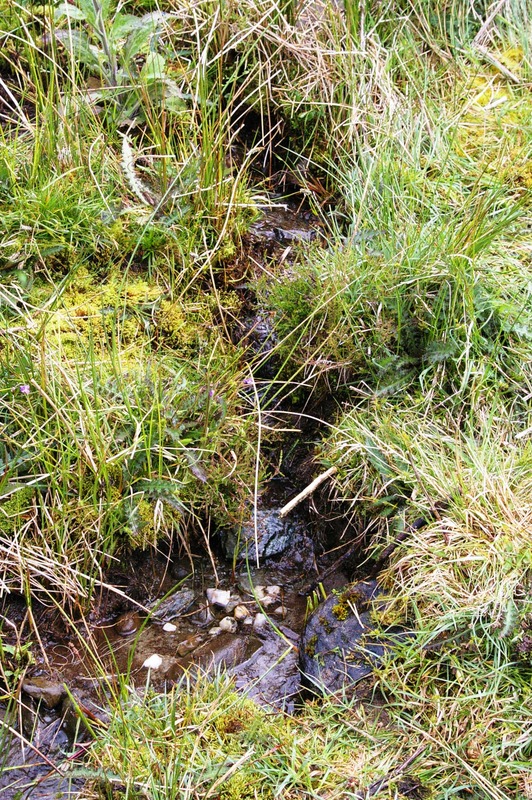 Argyll Presbytery » St Modan’s Well – found at last! St Modan’s Well – found at last! A century and a half ago the Ordnance Survey six-inch map showed St Modan’s Well on the hillside above Kilmodan (i.e. ‘St Modan’s Church’, the medieval church-site in the Clachan of Glendaruel). The name suggests that there was a local tradition of honouring this saint not only in the more formal setting of his church, where priest or minister would have led the community in prayer and preaching, but in the wild places, on the hillside in sun and wind and rain. Sadly, the 1869 map is the earliest reference we have to this hillside spring, but it is likely to have been honoured for a long time before that. Indeed, the map shows it as an antiquity (in Gothic lettering), so the surveyors clearly thought of it as an old place. Since that map of 1869 (and its second edition thirty-odd years later), St Modan’s Well has disappeared from the maps. The hillside on which it is found has been covered in commercial pine forestry, obscuring the landscape and damaging the fragile system of drainage and water-flow. Various efforts to identify the well have been made in the last few decades. Canmore (the Royal Commission website) placed it at NS0028 8446, which is the grid-reference we obtained by overlaying a geo-referenced online map on top of the 1869 maps. But the Cowal Archaeological Society, and its guiding star the late Betty Rennie, obtained other very different grid-references for it – apparently finding other features on the hillside which were not the St Modan’s Well shown on the old map. More in hope than in optimism, a little band of explorers gathered in the Kilmodan carpark on Saturday (27 June) and headed up the hill to find St Modan’s Well. We gave priority to the grid-reference provided by our map overlay, and we consulted our hand-held GPS (a luxury not available to Betty Rennie in 1967). We also regarded the 1869 map as an authority for the landform around the well – the fact that it flowed into a stream, which we assumed would form a natural gulley in the landscape flowing WNW as shown on the map. To our delight (and, I confess, slight surprise) we very quickly found the spring. Actually, it was the sharpest pair of eyes among us who first spotted it – those of nine-year-old Isaac. It was precisely where the old maps showed it, but hard to spot among long overhanging grass. Commercial forestry in the area has altered some of the drainage around it, but it is still flowing. It issues at NS 00285 84468, a tiny spring of cold sweet water issuing from the turf and rock. 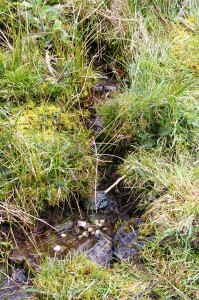 It flows about 70 cm downhill to form a little pool. In the pool are some quartz pebbles (and now a little coin added by these pilgrims). From there it flows down a gulley – the only one in the area, just as shown on the 1869 map – to join the River Ruel. The dedication of both the church and the nearby well toSt Modan invites us see them as two parts of a single pilgrimage landcsape. So it invites a visit which will involve a little walking between the two, and we hope that the Colintraive and Glendaruel Development Trust which now owns this hillside will be able to provide signage or other guidance to help visitors find their way. It invites reflection on the relationship between prayer in a place that is built by human hands and prayer in the wild and open spaces. Having hunted for the well and found it, we might now look for local lore about it. Does anyone remember the well being used, or stories about earlier generations using it? Are there any old documents – letters, references in books, sermons – which mention the well? One quest is over, and another begins. Meanwhile, come and lay your own quartz pebble in the pool. Enter into that stream of prayer and hope that once ran here, when people came to pray for a sick child or an elderly relation, to utter their longing in speech or in gesture in the presence of God.